A lack of rain or cooler weather this summer means more calls for University of Georgia peanut entomologist Mark Abney regarding lesser cornstalk borers. 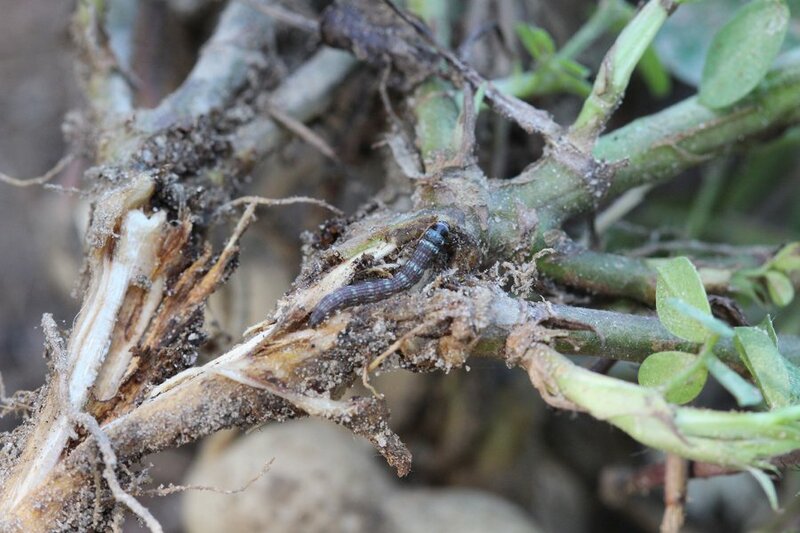 Because Georgia has suffered through droughtlike conditions all summer, granular insecticide treatments in nonirrigated peanuts are ineffective due to the need for rain to soak the chemical into the soil. Without rain, those peanuts are susceptible to the pest, which can cause significant damage to the crop. The insect, which thrives in dry and hot conditions, bores into the stems and pods of peanut plants. If it feeds on the pod, that's the end of the crop, Abney said. Even if it feeds on the outside of the hull, the damage provides an entry point for Aspergillus flavus fungus, which can lead to aflatoxin. The presence of aflatoxin will severely downgrade a peanut load. Aflatoxin is a carcinogen that becomes more common when peanuts undergo drought and heat stress. Insects that peed on pods, like lesser cornstalk borers, increase the risk of aflatoxin contamination. Management of lesser cornstalk borers is difficult, if not impossible, for those farming nonirrigated peanuts. Traditional granular insecticide applications are not cheap, farmers need a special applicator and rainfall or irrigation is required to activate the treatment, which has been lacking in south Georgia’s dryland peanuts. These treatments also eliminate beneficial insects, which can spark outbreaks of spider mites and foliage-feeding caterpillars. Additionally, the lesser cornstalk borer reproduces quickly. As temperatures rise and dry conditions persist, the borer reproduces faster. The number of eggs that moths lay and the speed at which they lay them increases. Though beneficial insects can have a big impact on borer populations, farmers can’t rely on predators when soil temperatures are very high. Lesser cornstalk borer eggs and caterpillars thrive in soil that is too hot and dry for insect predators. According to Abney, borers’ propensity to stay close to the ground makes them difficult to scout. The last time that Georgia peanut farmers had a bad outbreak of lesser cornstalk borers was in 2014, and it was what Abney viewed as the worst the state has seen. A dry July and August contributed to that outbreak, and conditions are similar this year. The bulk of reports of high pest populations have come from farmers in the area of Tift, Berrien and Ben Hill counties. Abney and his research team have been studying new, foliar-applied treatment options for the lesser cornstalk borer since 2014, but more research trials must be conducted before recommendations can be published. To keep up with updates about lesser cornstalk borers or other peanut insects, see blog.extension.uga.edu/peanutent/.